from People will tell you that you are spending to much time surfing the Internet checking things out, reading. looking at this and that, they will even tell you to "Get a life." What happens to us all so often is that we get the same experience on the web as we do with television, that is so much to choose from and nothing on. Crazy Today we have a few simple suggestions that are really different. Here is a chance to have a travelling experience and not leave home or empty out your VISA card. Let's face it when you talk to someone about their latest trip they tell you about the travelling experience, the airport, waiting to board, customs and what seems like the endless hours you have to spend waiting around. Well here is a site that will give you that experience. Its called "Just Plane Crazy" and it has something for everyone interested in avaition. 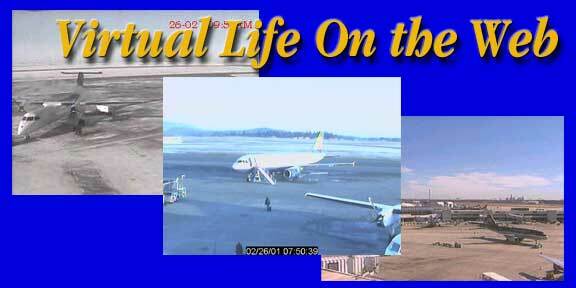 The pictures at the top of today's page are live web cam shots from Regina, victoria and Charlotte North Carolina, but this site has web cam shots from around the world and what is even more startling is that you can listen in on air traffic control from the world's busiest airports as aircrafts arrive and depart and ATC tells them where to go. microwave If you want to check out some aviation science this site is off the wall as you can have a look at the world's first microwave powered aircraft. toboggan But there is still room for some low tech fun a Saskatchewan man has produced a plastic toboggan. It is worth the visit to see the product and get an idea of the entrepeneurial spirit that cooked this one up. dictionary Now we all know there are distinct differences to the meanings of various English words. A fellow named Jeremy Smith has set to work producing a dictionary that identifies the differences between what a word means in England or in the United States. Here is where you can find his dictionary. outhouses But under that "perhaps this is more than we need to know" category is a web site dedicated to outhouses of America. Personally I was so pleased to see those things disappearing that I really don't want even to think back to them. Especially on a day like today. I believe that the introduction of indoor plumbing is more responsible for improved health than any medical break through up until now. How about some serious stuff? The Getty unveiled its impressively redesigned site this week, featuring "nearly 54,000 pages related to works of art and professional reports in conservation and art history." The heart of the new site is the Explore Art section, which includes 3,300 works of art, 1,500 artist biographies, 1,500 glossary definitions, over 200 video clips, online exhibitions, provenance information, and more. The collections may be browsed by an alphabetical artist index, collection type, or subject. The About Us section offers access to professional resources such as the Getty Research Library Online Catalog, research databases, conservation lab and field reports, and grant information and applications. The Visitor Guide section offers an interactive event calendar, information on planning a visit, and an online reservation system. A beefed-up internal search engine rounds out this speedy, attractive, and most impressive redesign. Created by Bill Carson, a Michigan pharmacist, as a spare time hobby, this site aims to make the works of Puritans, Scottish Divines, and other Reformed authors more widely available to the general public. Carson focuses on shorter extracts of "practical, devotional, and experiential works because they are so needed today." True to his purpose, the site is well organized, allowing readers to access works via a table of contents (with new additions noted as such), a site map, a fast index, and a search engine (this last, run via a Java applet, may cause some browsers difficulties). The site is shaped by Carson's contemporary outreach efforts and, no doubt, his taste, and so visitors may be surprised to find, for example, Edwards' "How To Know If You Are A Real Christian" but not "Sinners in the Hands of an Angry God." Nonetheless, the site is a good place to browse or to send students looking for further writings by the Puritans and Reformed authors, though note that very few American Puritans are represented here. The works are complemented by poetry, biographical and historical information, a Puritan quote of the week, and a brief quiz. The whole site can be downloaded as a .zip file, and Carson has even thought to add downloadable packs of sermons for Palm Pilot users in need of inspiration on the go. Released on February 14, this new report from the World Resources Institute (WRI) and International Food Policy Research Institute (IFPRI) "is the first comprehensive audit of the world agriculture's ability to provide sufficient food, goods and services that are vital for sustaining human life." The 95-page study warns that world food production is at risk from farming methods that have degraded soils, drained aquifers, polluted waters, and caused the loss of animal and plant species. Users can download the report in its entirety or by chapter in .pdf format at the IFPRI site.